Well, unfortunately, my cow was not selected by a “donor” at auction. However, the good people of Cow Parade are not ready to give up on seeing this idea become a reality, and neither am I. So I thought I’d put the word out and see if anyone is interested in becoming owner of “Infra-Red-Meat”, a supporter of public art in Detroit and a charitable donor to cancer research. My name is Steve Miller. No, not that Steve Miller. Although I do write songs and play guitar, my primary interest is fine art. Specifically, painting. I paint to see what my head, heart and hand can produce. My visual stories capture moments in time, abstract ideas and layered feelings. I explore abstraction as well as representation and sometimes I work in an exaggerated color palate. My cow, “Infra Red Meat” is inspired by thermal photography. Thermal imaging cameras take pictures of heat. Different temperatures show up as different colors. Violet and blue represent cooler temperatures, green is in the middle and red and yellow are warmer. White is hot. Warmer colors appear where there is less insulating fat and lots of blood flow. Because this isn’t a ‘real’ cow, I don’t find it important to depict ‘real’ thermal imaging. For me painting is about expression, not mimicking. 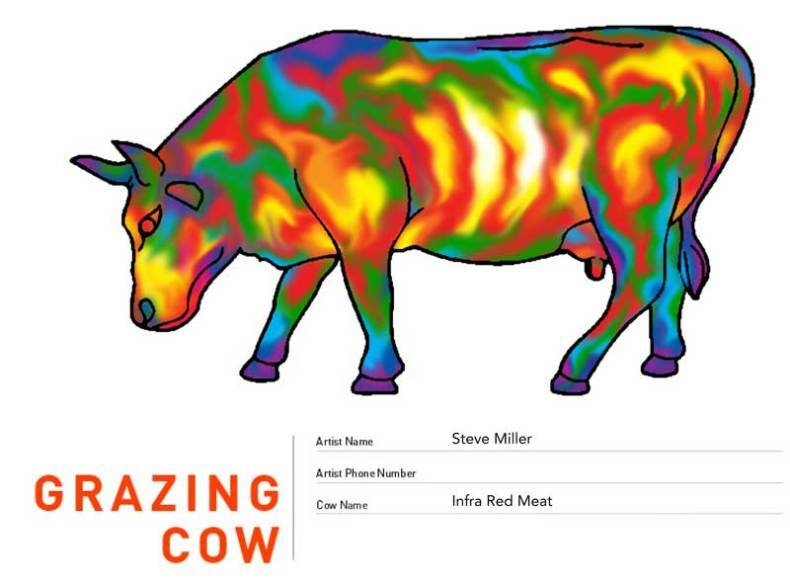 So, in order to integrate my head, heart and hand, I chose to imagine and interpret what the cow might look like as if my eyes where thermal cameras, using my own body and limited understanding of bovine anatomy as a reference. I hope that when you look at a fiberglass cow decorated this way, it makes you think about cows in more ways than just a public decoration.